Crash Dummy is a remarkable indie game with a story-driven nature and endearing characters. This isn’t the first time developer Twelve Games tells the story of the adorable CID, a living Crash Impact Dummy, as the original CID The Dummy game appeared on PS2, PSP, PC and Wii in 2009. 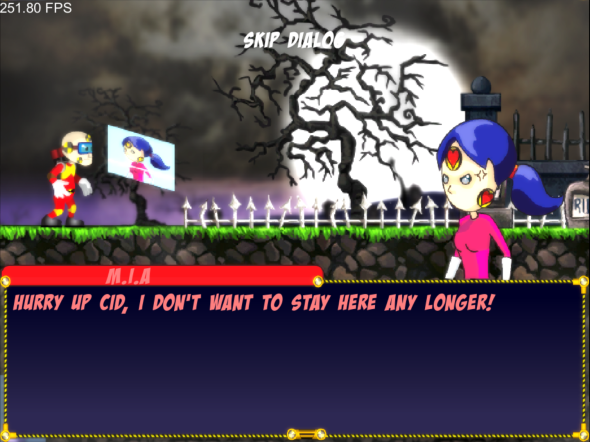 This time however, CID’s story takes place in a 2D side scroller with beautiful vibrant colours. CID is a living crash dummy with a mission. He makes his way through various levels with only one goal: to rescue his professor’s kidnapped daughter from the evil D-Troit. Doing his very best to become the hero that he has always wanted to be, CID learns how to use a bazooka, climb walls, sneak through security lights and fight bosses. His journey brings him to many places: from creepy basements and lava dungeons to even ice castles. On his way through these levels, CID encounters many different characters that all have their own personality. These characters very much fit into cartoon tropes or stereotypes, but the game means to do this, and it works. The villain, D-Troit, wouldn’t look bad in an animated TV show, and you can’t help but love the adorable CID. Text in the early access version of the game can sometimes flow a bit too fast for players to always understand everything that’s going on, but this is undoubtedly a bug that will be fixed by release date. Whenever it is possible to read the text accompanying cutscenes, it is clear to see the story is simple but well written, and that interactions with other characters are valuable to the story and interesting on their own. The typical hero-saves-the-princess scenario works for this game, simply because of how endearing CID is. His dialogue makes him out to be a very innocent character, and it’s easy to feel sorry for him when he yells “ouch” when hurt. Crash Dummy’s soundtrack is fairly impressive overall, as its music has an arcade-like feel to it which works great in combination with the comic book style that the rest of the game exudes. CID does pack a punch, and fighting enemies is a lot of fun, especially with the sound effects the game has to offer. Some sounds in the game can be quite annoying though, whenever there’s metal involved (e.g. metal rotating bars that CID needs to jump over), the accompanying cheap-sounding audio effects can cause quite a bit of frustration. Overall though, the game does a great job at staying true to itself both with audio and graphics. There is enough variation in level design to keep things interesting. Not only is there a lot of diversity (lava, ice, swamp, sneak and sewers missions all in one game anyone? 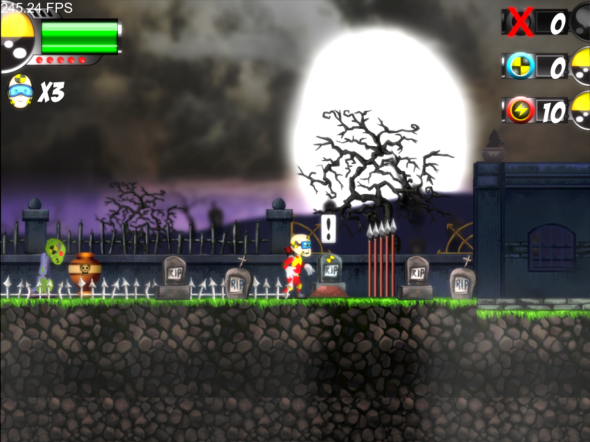 ), but all the levels are visually gorgeous and a 2D approach is definitely appropriate for this type of game. Crash Dummy’s art style is great, and excels in its simplicity. As we’ve mentioned earlier, the game sometimes almost resembles a cartoon or comic book. Characters look fun and it’s easy to figure out which role they’re meant to fulfil; the villain looks scary and the “princess” actually has hearts on her face. Since the game’s story is mostly delivered through text, the developer has also paid a lot of attention to choosing an appropriate font. Again, the font wouldn’t look out of place in a comic book. Crash Dummy knows what it wants to do, and does it well. Crash Dummy isn’t a terribly difficult game. Aside from platforming, it only really offers a challenge when it comes to its bosses. 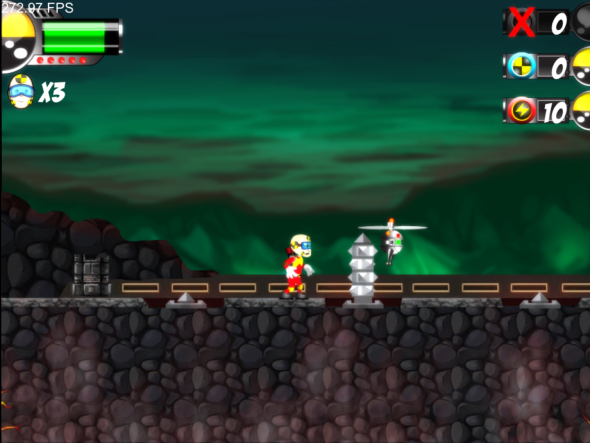 Smaller enemies are easily taken out (or even jumped over), but in later levels the game does provide a challenge by placing moving platforms in between lava streams and enemies. Luckily, CID has a great guardian angel, as he has multiple lives and can even retry the level after going through all of his lives. The controls are very responsive, which is a must for any platforming game. Not all aspects of fighting work as well as they perhaps could, but this is never really a big issue as CID packs a powerful punch to begin with. Additional fighting mechanisms such as panic mode and CID’s bazooka are all meant to diversify combat. Sneak missions are fun and work well. Crash Dummy also has a fantastic tutorial section, which explains the game’s mechanisms without ever feeling like it’s babying you. 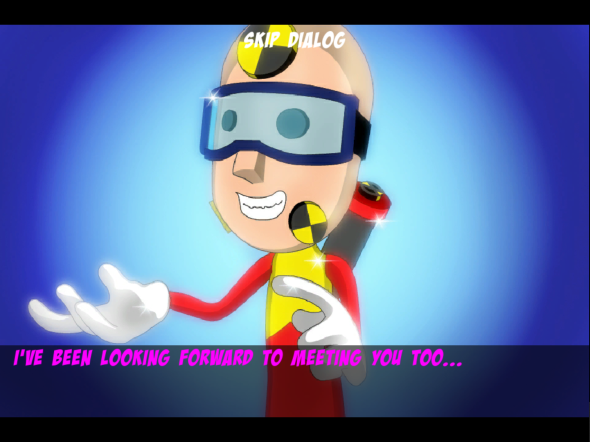 There are still some bugs since Crash Dummy is in early access, but they’re very limited for an “unfinished” game. The game also has surprisingly small loading times and runs very smoothly considering circumstances. Overall, Crash Dummy is a very, very fun feel-good game with an addictive character. Characters are endearing and the art style is gorgeous. CID is a fantastic protagonist as he’s very cute and his innocence and desire to be a hero drive the story forward and make the player want to keep going. The game also has a great soundtrack, even if some audio effects sound a bit cheap from time to time. Crash Dummy is a great game in its genre, especially since it’s still in early access mode. One drawback may be the game’s price: as a more expensive version of its mobile release with the same content, it might be a better idea to pick it up on your phone or tablet! I'm a 24 year old gamer with a passion for RPG's, and the gaming community as a whole. When I'm not gaming, I can be found cooking, reading, or with my partner and pets. Currently on: PS3, PS4, Xbox 360, PC and 3DS. Upside-Down Dimensions – Now Available in Early Access!